On Sunday morning, after the wedding, we all agreed we would attend the Chapel service. It was super hard to sit through. I remember the days when I was a Practitioner and I would love to hear “The inspired word of The Bible” and “correlative passages from Science and Health,” but this day at the Principia Chapel just felt tedious (no matter how much I love that Chapel as a building and I love looking at the architecture). The organ felt too loud and blasty, the Readings were tremendously long, the solos always grate at my ears. I realized I no longer fit in this sort of church experience at all. I was so glad it was only an hour and I was so glad when it was over! I have now been in the Quaker Meeting as a member for almost 2 years, and my beliefs continue to mold and change, and I love that I have complete freedom and support from my Quaker Friends to be Me. They love me for who I am, and they support me 100% as my beliefs change. I feel completely accepted and loved and cherished. I finally have friends, and I don’t feel like “I am better than anyone.” I feel at peace and equal with everyone. I have a Friend who was incarcerated for a minor offense. And it is good for me to learn his challenges, so I can be educated. I got a card from one of my new good Friends, a year after my dad died. I opened it, read the compassionate note, and just cried and cried. It was so loving of her to remember my dad’s death and send me a compassionate card a full year after his death. I never received cards from Christian Scientists upon my dad’s death, but the Quaker Friends sent me multiple cards. I had barely walked in the door at the Quaker Meeting, and a few short months later, my dad got really sick and died. The doctor had given him a clean bill of health (other than the Parkinson’s) just a month before. At my dad’s memorial service, the church was so filled – there were so many people standing at the back, and the foyer doors were opened, and the whole entry way area was completely filled, and people even had to stand on the stairs going down down to the Sunday School. That’s the last time I set foot in a Christian Science church. I don’t know if it will be my last, but it was amusing (or sad?) to see it filled to the absolute brim. I think there was only a handful of Christian Science church members there at that service. All the rest of the people attending were friends, family, neighbors, and my Quaker Friends who had never even met my dad. After my dad died, I was grief-stricken. He was the only parent I had who had been with me and cared for me my whole life. Everyone else in my life had come and gone, or come in later. My dad meant the world to me. Christian Science teaches us we can’t grieve, because death isn’t real. My emotions were so squashed for so many years, though, that I couldn’t help but grieve. Two friends who had left Christian Science suggested that I go to therapy for grief. This was a radical concept to me. I was afraid, and it is against Christian Science. I can’t explain what I was afraid of, but it was definitely not an idea that I was comfortable with. I knew that in Christian Science, I had always been taught that to counteract grief and depression, it’s necessary to sit down and write “gratefuls.” I challenged myself to write 100 things I was grateful for, and I figured it would heal my grief over my dad. I sat down and without stopping for any breaks, I easily wrote 112 things I was grateful for. I decided that was enough things, and I put my pen down. My mood hadn’t changed. I was still as depressed and grief-stricken as ever. I decided it was time to get real counseling. I didn’t want to futz around, so I did a search for a high rated female counselor, covered by my insurance. I went in, told her I was grieving over my dad, and we began weekly counseling sessions. She was a phenomenal person. She sat by me and helped me figure out my next path. 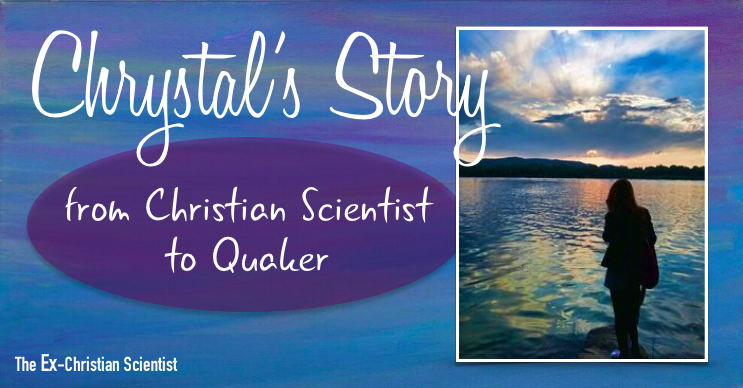 It turned out that she helped me realize Christian Science was no longer a path that worked for me. She helped me gain courage to tell my family, to tell The Mother Church, and to leave my Christian Science Teacher. Meanwhile, the two friends who had suggested that I go to counseling and I were talking more and more about our experiences growing up in Christian Science. We had many parallels, and it was incredibly validating to realize we had so many of the same traumas and experiences. It was almost eery. One of my friends did a search for “Ex Christian Science” and came across this blog and the Facebook group. We all joined very quickly, and found a whole new set of friends. This set of friends have been the most validating group of people I have ever known. I have healed and changed so much in the last two years since my dad died. It’s quite remarkable. I am finally finding happiness for real, and I’m able to express an appropriate amount of anger or sadness instead of constantly being on the verge of stifled tears that won’t stay stifled any more. I am a much more emotionally balanced and healthy human being. I no longer struggle thinking “that’s not a part of me, I better heal it, or someone will judge me, and I will be yelled at.” I feel centered and calm. I am a much better mom, spouse, friend, co-worker. My life is so much better than it was when I was a Journal-listed Practitioner – the goal I had wanted to have my whole life. Words! That hit a trigger! Weren’t we told that Mrs Eddy, in her writings, used a vocabulary second to Shakespeare? Odd that now I lost be in a city who’s claim to fame, besides barbeque, is that we have so many fountains- the only city that has more is Rome. So I was was raised in a religion who’s founder had a vocabulary that was second to Shakespeare, and I live in a city who’s number of fountains is second to Rome. *Why do we ALWAYS refer to her by her full name? Or we do this crazy thing & abbreviate it to MBE. All other authors and famous people are referred to by their last name only! So crazy!! At least we don’t have to say Mary Glover Baker Patterson Eddy. Grateful for that! It is ironic to me that people take marriage advice from her, too, seeing as she was married 3 times and miserable in all of them. Glad to hear you have found a supportive circle of friends and Friends. One thing I noticed that you said about Prin. I was raised in CS but my parents did not believe in any benefits of attending Prin. (I attended the local public school, which was a very fine school). Other Christian Scientists would occasionally push me to consider Prin, or ask us why I didn’t go to Prin. We were invited to “Prin parties,” which were intended to recruit students. When I/my parents asked what the benefit would be to sending me several states away to go to an expensive boarding school, the answer was always, “the campus is so beautiful.” Even at the one Prin party we went to, that was the ONLY thing they could tell us about why anyone should go there: “The campus is very beautiful.” “It’s so pretty there.” The presentation consisted solely of photographs (slides) of landscaping and architecture. Well, guess what. There is a lot of beauty in Ohio, too. I could look out the window for free and see it any time I wanted. I didn’t have to drive ten hours or pay a lot of high tuition or live away from my parents to see beauty. Principia is not the only place in the country where you can see beautiful buildings and well-kept landscaping. It became a big joke between me and my mom for years. Any time anyone mentioned Principia, we would wink at each other and say something about how beautiful the campus was. The Prin-goers never got the joke. They would always agree, yes, the campus is truly beautiful. Nobody ever gave us any other reasons for going to Prin. None! By contrast, other, local private schools also recruited. We were given credible reasons for considering those schools; for example, excellence in education, or a superior music program, or successful anti-bullying policies, or even just a solid moral foundation. I knew kids who went to those schools, and they always had substantial, real reasons for attending — not just, ‘the campus is really beautiful.’ I have no idea if there really are/were any educational reasons to attend Prin, or if the Prin alumni just didn’t know what they were. So, my dear, I could not but help notice, with private amusement, your referrals to the beauty of the buildings at Prin. I have never been to the Prin campus. But I know you are right: it is truly beautiful. Joanna, I must confess this comment made me laugh out loud. “The campus is very beautiful” was my standard fallback topic when making polite conversation with CS-church ladies who ask about my time at Prin! It was safer than talking about anything else. Oh my gosh, Joanna! I am sitting here covering my mouth and laughing! Oh that’s hilarious! Thank you so much for letting us in on the joke!! This will be my new favorite joke!! My older child used to have the goal of going to Principia. And I was so proud of him. And now – I’m pushing him to all the wonderful local in-state schools near us. Any one of them is excellent, and several of the very good ones are within an hour drive and he could live at home. The whole, “you can do a lot when you can fit your entire class in to two cars” thing got me. BUT – that’s probably not a great reason to attend a college either! Hahaha! Yeah – that’s a great reason to go too. That’s also what convinced me. I was brain-washed to believe “it’s better than every other place in the world!” Yikes. Must be because of Bernard Maybeck’s architecture. Here’s a funny thing — I grew up in an area where the fall colors are incredibly bright. Is there another place in the country where the colors are more bright? Absolutely. Just beautiful, radiant, bright colors. My first semester at Principia was Fall. (As it is for the majority of students, I think, starting college.) Driving there from the airport, the person who was driving me said, “look at the colors!” And I looked at what were supposed to be “the beautiful bluffs overlooking the Mississippi” … and they all looked brown to me. It was a sea of blah. At that moment, I wished I had stayed in my home state, because I realized right then, that I was now missing all the wonderful colors back home. I think the Fall colors at Principia are plain old muddy looking. It’s so weird. I heard about the “it’s so beautiful!” my whole life, then was completely let down. I no longer think it’s beautiful. I mean, the landscaping is gorgeous, and I love smelling “Lilac Lane,” but I can easily get all that beauty locally where I live, even in my own town. Even our local Home Depot has stunning tree colors around the parking lot. It’s a breath-taking parking lot at Home Depot. Thank you, Joanna, and also thank you to Susan for your comments. It means so much to me to see that people read my story. It’s now been over a year since I finished writing this blog (the last few posts are getting posted now), and it’s been incredibly healing to write this story & share it. Thank you so much for your comment, Patsy. I am so sorry you’re feeling so alone in all of this. I am glad my posts validate your inner truth. 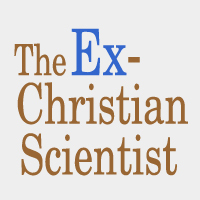 Do you know about our Facebook page for Ex Christian Scientists? The latest blog post on this blog has links to it and such. It’s an amazing community who get the weird Christian Science teachings / gaslightings / denial / special kind of anger and/or sadness….. I recommend you consider joining the group and reaching out for help with grief over the loss of friends and family. I myself just attended a funeral for someone who I believe was what I am starting to call “sympathetic to Christian Science.” Her stepchildren and her mom are all still in the belief system, as far as I can tell. And I think she never went to doctors for her annual checkup. It’s because of that, that she died in her 40s. At the visitation, I kept hearing so many people say: “It just doesn’t make any sense.” I grieved so hard every time I heard that. She left a whole lot of people feeling desperately sad.